UFOs, flying saucers and ET conjure up images from Hollywood films and blurred photos in tabloid newspapers. But a number of true believers in China, many of them highly educated, see merit in exploring unidentified flying objects and alien encounters scientifically. Meng Zhaoguo, a 35-year-old tree grower from Wuchang City in Heilongjiang Province, can still vividly describe the Steven Spielberg-type scenario he claims to have witnessed nearly 10 years ago: As he sat in a huge white, gleaming spaceship, a tall creature with a large head and eyes like light bulbs and clad in an inflated seamless rubber suit perched on a metal sheet that hovered in the air. In a metallic-tinged voice, this interplanetary visitor communicated with a man via a television-like screen, predicting a collision between a comet and Jupiter. As sensational as it sounds, Meng insists he was taken aboard the ship a month after being shocked by some sort of waves emitted by a silver-coloured object on a mountain he and some other villagers attempted to approach in June 1994. Such accounts have served to shroud ufology - the study of UFOs - in a kind of mysticism, a word often used when referring to the subject. The Chinese public first learned about UFOs in 1978, when leading State newspaper the People's Daily ran an article about the phenomenon. Although many accounts of UFO sightings have appeared in the media in the ensuing two decades, the voices of doubt are as strong as people's curiosity. But despite the cynicism, more than 40 ufology associations across the country have registered some 5,000 believers, not including academicians interested in UFOs. With no State funding and little private sponsorship, the community feels discriminated against and excluded from mainstream scientific circles. The sceptics's main demand seems simple enough, but satisfying it is harder: Show me the evidence. A photo or video footage, which can be easily fabricated, is not sufficient. They want to see a real object, a flying saucer, something of a mission impossible for ufologists. Describing ufologists as Rmantics, Sima Nan, a popular science writer and a leading figure in the country's fight against pseudo-science, says the most important thing in scientific research is to base a study on concrete evidence and avoid subjectivism. Those who alleged to have seen UFOs or had extraterrestrial (ET) encounters, be they an innocent child, sincere woman or down-to-earth farmer or a retired cadre, all lack hard evidence to prove their claims via objective and scientific methods. 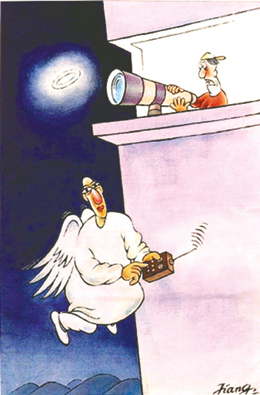 "Research work based mostly on imagination is not research at all, "says the writer, adding that the standard telescopes and hand-held video cameras commonly used by ufologists cannot meet the stringent demands of scientific research. Ufologists, however, believe their research to be as significant as the country's space exploration programme, even if it is not currently being taken seriously. If space exploration includes the search for alien civilizations, they argue, UFO research can serve to supplement it. Tian Daojun, a professor at the Nanjing University of Aviation and Aeronautics, says that human fantasy is not totally meaningless in scientific research, as some UFO sceptics assume, pointing out that the fanciful notions of human beings did eventually put a man on the moon. The numerous UFO sightings reported should never be ignored or denied, Tian says. Any information gleaned about the way alien spacecraft function might serve to upgrade scientific research, resulting in breakthroughs in aviation and aeronautics technologies on Earth. But what upsets UFO researchers most is the suggestion that UFOs are nothing but mythology and ufology is just a new form of pseudo-science. Ji Jianmin, a UFO enthusiast in Feixiang County in northern China's Hebei Province, dismisses such assertions as too opinionated and unfriendly to UFO researchers and criticizes detractors for their own unscientific approach to the subject. Ji, a former high school art teacher who currently runs a nameplate design service, became interested in UFOs in the 1980s. He firmly believes in the existence of civilizations on other planets as well as the potential for a kind of psychic connection between residents of Earth and aliens. A graduate from a local vocational teacher training college, Ji admits that his education falls short of arming him to study UFOs scientifically. But, he adds:" that does not necessarily mean I'mnot qualified to do my part. When it comes to UFO research, everyone is a primary-school pupil, from fans with scant education to established experts in various scientific fields." The controversy surrounding UFOs is very natural, so long as each side does not force its ideas on the other, according to Wu Jialu, a Shanghai aircraft expert. Wu also finds it natural for people to become interested in the mysteries of the universe. It's quite nice that people care about things outside their immediate world, as it shows a willingness to expand their vision, and the exploration of the unknown is, after all, both interesting and important. Even within the UFO community, ufologists differ in their approaches to research, although they all consider alien spacecraft and intelligence to be at the very heart of their research. One school tends to focus on the more practical aspects. Some, like Wu, expect to get inspiration by contemplating the mechanics of alien spacecraft as a means of improving Earth aircraft or even spaceships. 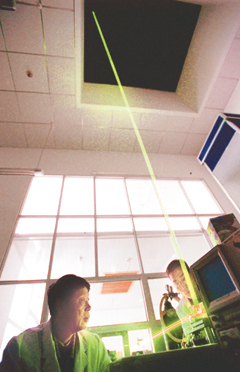 Others, including Su Congbo, a seismologist in Taiyuan, capital of north China's Shanxi Province, are interested in finding out whether there is a connection between UFOs and natural phenomena such as earthquakes. 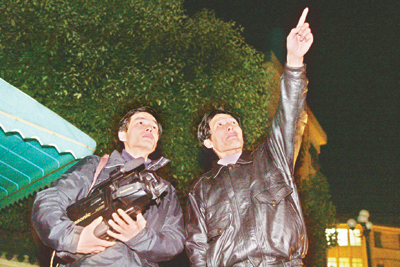 Beijing-based ufologist Zhang Jingping stands for yet another school of thought in his persistent attempts to prove the existence not only of UFOs but also of alien civilizations. Zhang, the 30-something owner of an advertising firm who considers ufology his real career, has put a great deal of energy into investigating UFO encounters. A graduate of the Beijing University of Aviation and Aeronautics (BUAA), Zhang says he has no doubt that visitors from other planets have had a considerable amount of contact with people on Earth. Not one to shrink from the courage of his convictions, he even named his advertising company Flying Saucer. In early September, Zhang invited police technicians and psychologists to subject Meng Zhaoguo to a lie detector test and hypnosis experiments in Beijing. The test results, he says, prove that Meng was telling the truth. Zhang also believes the scars Meng bears from the incident, which doctors said could not possibly have been caused by common injuries or surgery, serve as further evidence of his ET encounter. But Liu Daoye, a retired expert on national defence based in Nanjing, capital of eastern China's Jiangsu Province, contends that a belief cannot be based on something that cannot be explained, such as the scars Meng says were inflicted during his alien adventure. However exciting the reports of UFO witnesses and however sensational the claims of encounters with ETs may be, Liu says, ufologists must base their studies on serious research and concrete evidence to avoid misleading the public. "I believe in the probability of intelligent life on other planets, but I doubt such beings have ever travelled to Earth," he says. "To date, no one who has claimed to have encountered an ET can produce concrete evidence, so advocating their existence can only lead UFO research towards mysticism." He says that while the reports of experiences similar to Meng's are not necessarily lies, they are more likely the result of some sort of optical illusion. Zhang does argue, however, that UFO research should not be fettered by the limitations of modern science and technology. "We need new conceptions in UFO research, as current science and technology theory also need improving." Cao Lixing, a postgraduate student majoring in computer science at BUAA, says proving the existence of UFOs or flying saucers is important to advancing serious study. "As long as the existence of such phenomena remains unproven, UFO research will never escape the bounds of scepticism," he says. The young man became interested in UFO research after listening to a lecture Zhang and Meng gave in late September. He also accompanied Zhang to Qinhuangdao, a northern coastal city in Hebei, in early October to look for the landing site of a flying saucer in another alleged ET encounter. Cao says he appreciates Zhang's enthusiasm and devotion, but admits that it is hard for the average person, himself included, to believe any ET story unless they have such an experience themselves. A farmer with only five years's schooling, Meng Zhaoguo says he had never heard the term "UFO" before researchers visited him after his story was reported. After his experience, Meng was sought out by some locals hoping he could cure their diseases, as they reckoned his encounter might have given him special powers. Meng says he refused their entreaties. And more business-minded people wanted to advertise Meng as an attraction to encourage tourism to the region. Acknowledging the overwhelming doubt he sees in people's eyes when he recalls the incident, the farmer, who has participated in more than 100 interviews with the media and researchers, says that UFOs and ufology, which were originally unknown to him, have disrupted his life and made him feel uneasy. "But ufologists still take great interest in Meng's UFO encounter nine years on. they hope there will be a conclusion to the UFO phenomenon as soon as possible; only then will I feel released," sighs Meng.